The worms crawl in and the worms crawl out are lyrics to a song but are in fact, what happens and needs to happen to decompose our garbage. Earth worms (there are approximately 2,7000 species known) eat and digest garbage and excrete nutrient-rich worm waste! Their excretions (called castings) are one of the richest soil improvements around. 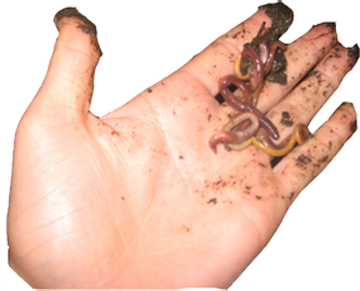 Worms help bring fresh air and water into the soil and decompose grass and leaves at the top of the soil. The work of worms is to eat their weight every day, distribute their castings and build tunnels as they move. Earthworms leave slime behind which contains nitrogen, an important nutrient for plants. Charles Darwin was so interested in worms that he spent 39 years studying them! So worms are important to our soil, and our soil is an important part of the cycle of life. Worms are not just good for fishing! You can’t live without worms! Have worms! Have healthy soil! Activity 1 – dig for worms! Find a digging utensil like a trowel. Go outside and being careful not to disturb plants, dig into the ground. Is your soil hard or soft? Did you find any worms? If you do not find worms in one location, try a few other spots. 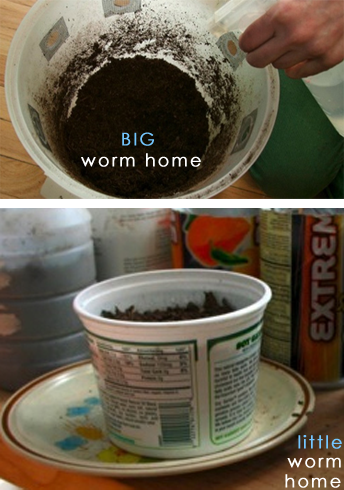 The more worms, the healthier your soil is! Worms are not just for birds! Activity 2 – diagram a worm! Draw and label the main parts of a worm. Did you know that a worm has five hearts? How do worms breathe? Which end is the top, and which end is the bottom? Do worms have eyes? Use the Internet and books as a reference, draw a picture of a worm in your journal and label the different parts of its body. Activity 3 – build a worm house! Find and clean a plastic storage container, an old box, drawer or barrel. Have air holes drilled into your container at the top and drainage holes at the bottom. Worms need bedding to move around in, eat, rest, and keep moist. Shredded newspaper, cardboard, leaves, sterilized sand and soil make good bedding. Worms like to be warm, but not hot. Try to locate your worms in a room between 55-75 degrees. Order your red worms or get them locally at a bait store. 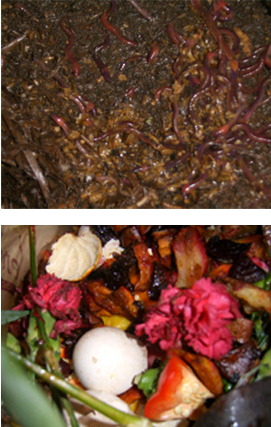 Move in your worms and start composting! Worms love to eat vegetables and fruits. Feed your worms apple scraps, banana peels, orange rinds, lettuce, tomatoes, carrots, celery, cucumbers, cabbage, potato peelings, coffee and tea grinds. Do NOT feed them meat, poultry, fish, or oil based foods. Earthworm slime is made of carbon. Worms in soil are a sign of the health of the soil. Worms eat and digest garbage. Compost it! Don't Waste it!